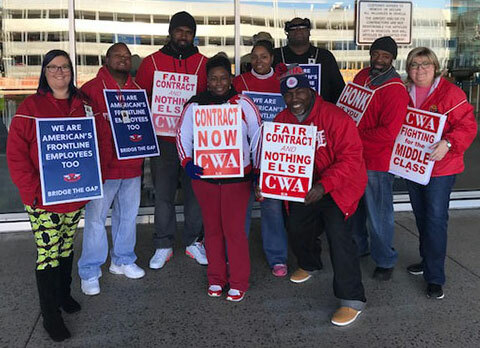 Frustrated that contract negotiations have been dragging on for the past year, CWA passenger service agents at Piedmont Airlines held informational picketing at Philadelphia International Airport, Charlotte Douglas International Airport, and Sky Harbor International Airport in Phoenix, AZ. The agents are calling for the airline to get serious about negotiating a fair contract. CWA represents 4,600 Piedmont agents nationwide, as well as 3,800 agents at Envoy and 14,000 passenger service agents at American Airlines. Agents and allies are demonstrating their determination to get a fair contract and end the pay gap between regional airlines and mainline carriers. Despite extensive job responsibilities and long hours, Piedmont agents’ pay is less than half of the pay of mainline agents’. Workers doing the same job at American Airlines, Piedmont’s parent company, make twice as much and “keep getting raises,” Barden said.